Any chance this bird finds it’s way to another pieces of paper for a art print? This is a MUST have!!! So in love with it…excellent work Marq! Sooo….any chance tomorrow is the day? 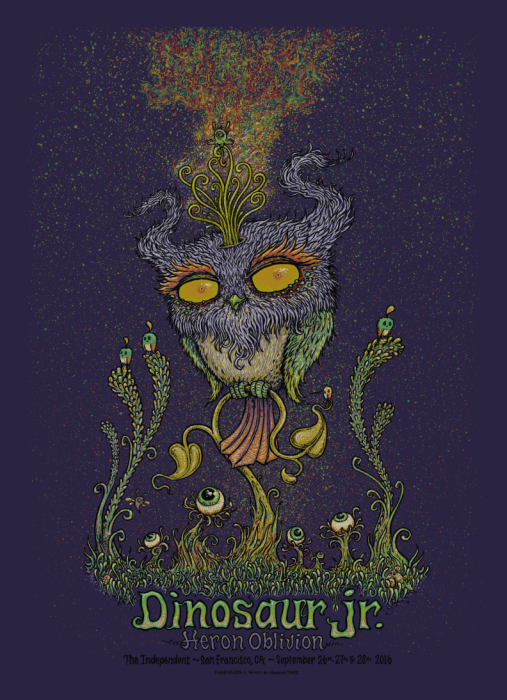 How much will the Dinosaur Jr. posters be? The ones that popped up yesterday were $75 for the AE and $150 for the variants, if I remember correctly. Where did they pop up at?? In the shop. It was an accident, but a few were sold. Dark Blue rubber, Teal, and Absinthe. Pretty bummed about not scoring Dino jr. Went through all three versions and continued to cart for a half an hour until the AE’s were gone. Just no luck. Looking forward to what’s coming next from Marq! Cheers!